The JetGo 800AL-RJ series is now discontinued. It has been replaced by the JetGo 600Mti-RJ ground power unit, which offers many improvements over its predecessor. Click here to view the new JetGo 600Mti-RJ diesel-hybrid GPU. 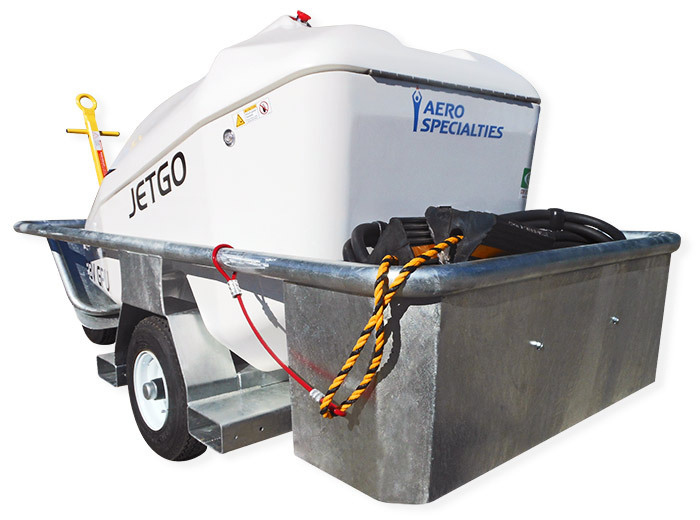 The AERO Specialties JetGo 800AL-RJ 28.5V DC diesel-electric hybrid aircraft ground power unit (GPU) provides impressive continuous and peak power in addition to offering advanced aircraft protection systems. The 800AL-RJ features a turbo charged 4 cylinder Kubota diesel engine with 800 amp continuous performance at 28V DC and a 2300+ amp starting capability. 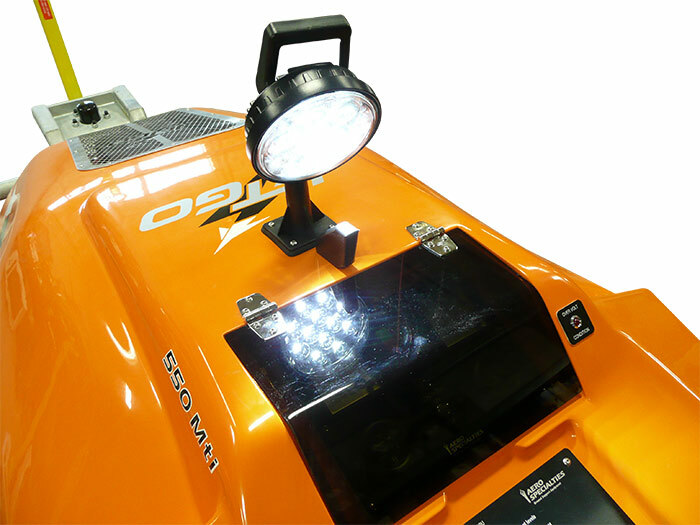 The hybrid battery system features 4 batteries with absorbent glass mat technology, allowing for improved reliability and reduced maintenance, even at low temperatures. 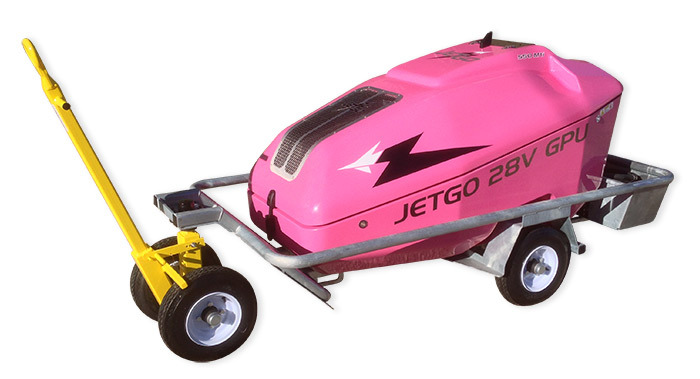 The JetGo’s light weight and compact size leads to easy portability, whether across the ramp or around the world. These GPUs provide a sophisticated ground power solution for aircraft avionics and maintenance support, electrical, air and environmental systems as well as aircraft engine starting needs. The model 800AL-RJ is mission-built for the support of all Regional Airline Turboprop and 28.5V DC Jet airframes. This unit performs all support functions, including gate support and aircraft starting – even on the toughest applications (such as ATR, Q400, and SAAB airframes). The model 800AL-RJ unit complies with performance standards established by regional airframe manufacturers including ISO 6858, addressing minimum voltage and amperage standards. 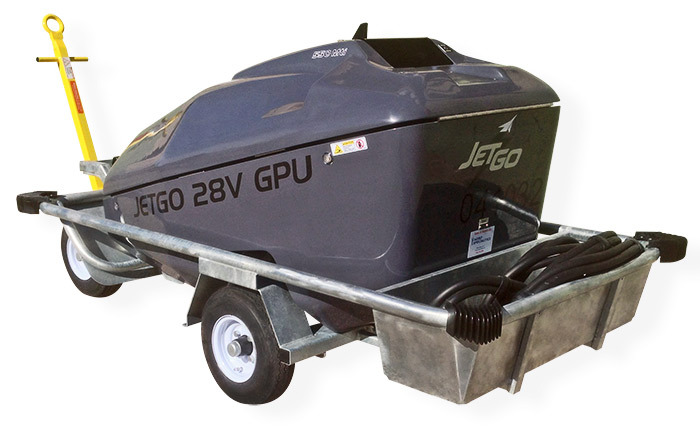 JetGo GPUs have been specifically designed to meet the increasing demand in the aviation industry for a quieter yet powerful green ground power unit. With an EPA Tier 4i rating for low-emission nonroad diesel engines, JetGo GPUs meet all current air quality emission standards. Its brilliant design, from both a functional and aesthetic standpoint promises to set a new standard for 28V DC ground power units. The 800AL-RJ’s amazingly compact size, peak power, aircraft protection features, operator safety and ease of use have made this truly a one-of-a-kind unit. 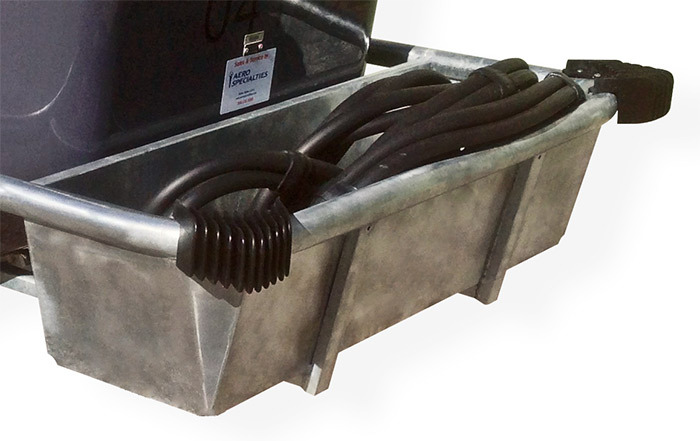 Already a popular unit with military installations, FBOs, MROs and regional airlines; these ground power units have also become a hit with corporate aircraft operators and flight departments who appreciate the ability of becoming self-sufficient in external aircraft ground power and service – all without breaking the bank! 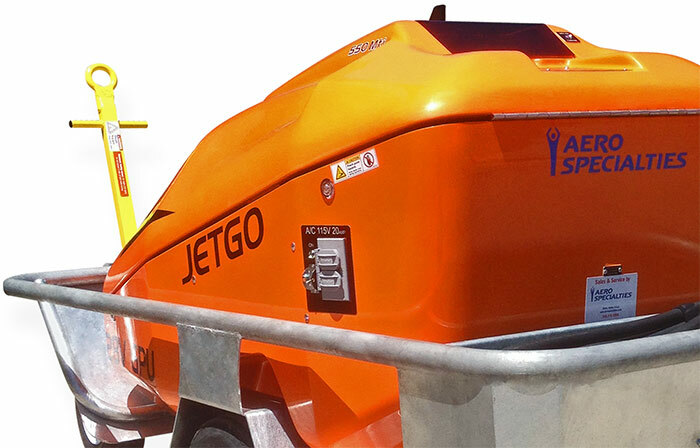 The JetGo 800AL-RJ boasts a heavy-duty RJ1 galvanized rust-proof trailer and integrated cable tray. 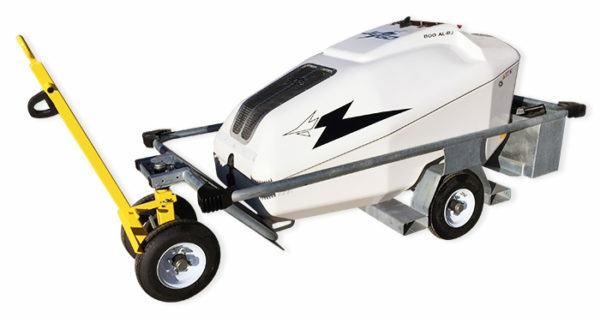 Compares to Hobart Jet-Ex-6, Jet-Ex-6D, Jet-Ex-6DZ eLite Series 28.5 VDC Ground Power Units. Also Compares to Tronair/Arvico 28.5 VDC Diesel GPU, part numbers 112820C1T3, 112820CS1T3, 112820CST3, 112820CT3, 282500, 282500C, 112820C, 112820C1, 112820C2, and 112820CS. 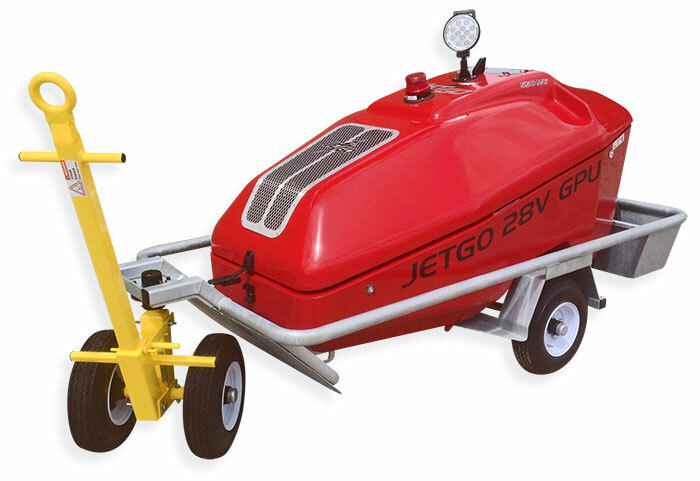 Other comparisons include Jetall JTL28D3, Tug Technologies/Davco Magnum GP28M, Davco 7028 TVC Magnum, Batesfield Diesel 2000/3000, FCX Systems GPU028-600-C.
Each JetGo option is represented by a unique AERO Product ID. When requesting a quote, please specify each option you would like to order in the "Options" area above. Click on each thumbnail to view a detailed image. JG550-01-425: Custom color option for JetGo units. We will work with you to design a JetGo unit around your custom color palette. 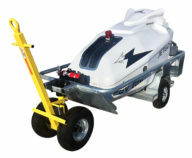 JG550-01-426: Bumper kit for JetGo units. Includes 4 protective corner bumpers. 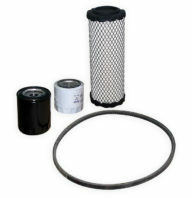 JG550-01-428: Cold weather kit for all series of JetGo diesel Hybrid units. Includes engine block heater, two aircraft start battery blanket warmers, and one Optima engine start battery with warmer blanket. Requires 15Amp 115V service. 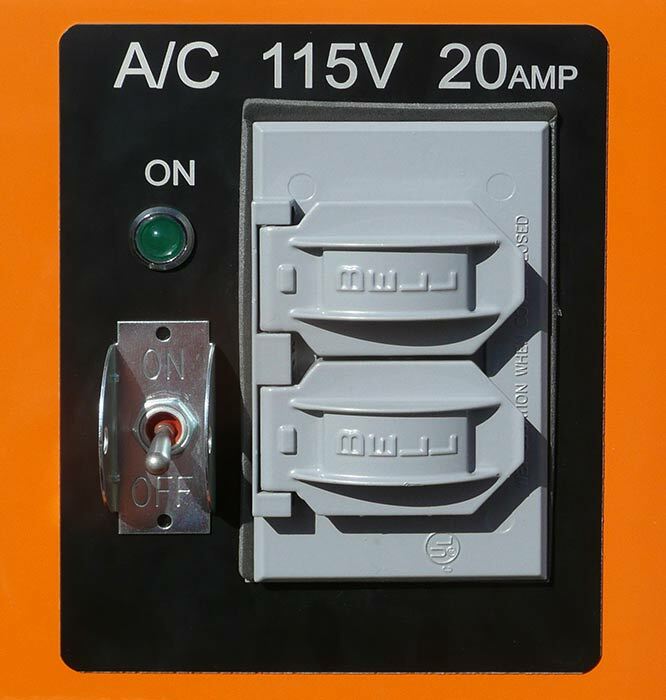 JG550-01-429-24V: 115V or 220V AC convenience receptacle for all series of JetGo diesel-hybrid units. 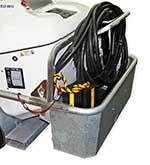 Includes 115V or 220V AC control panel with duplex 20 amp GFI receptacles (3,500 watt rating). Allows user to power devices such as vacuums, power tools, lighting, laptop computers, and more. 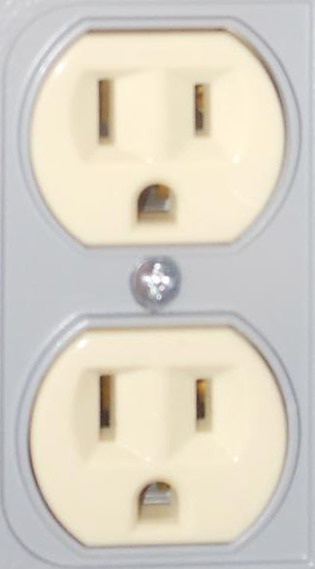 Customer must specify 115V or 220V AC option when ordering. JG550-01-430: Engine block heater for all series JetGo diesel-hybrid units. 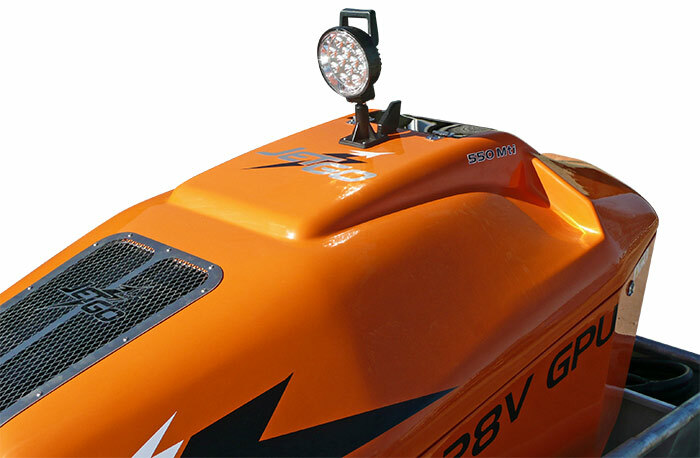 JG550-01-432: 12V LED mounted spotlight. 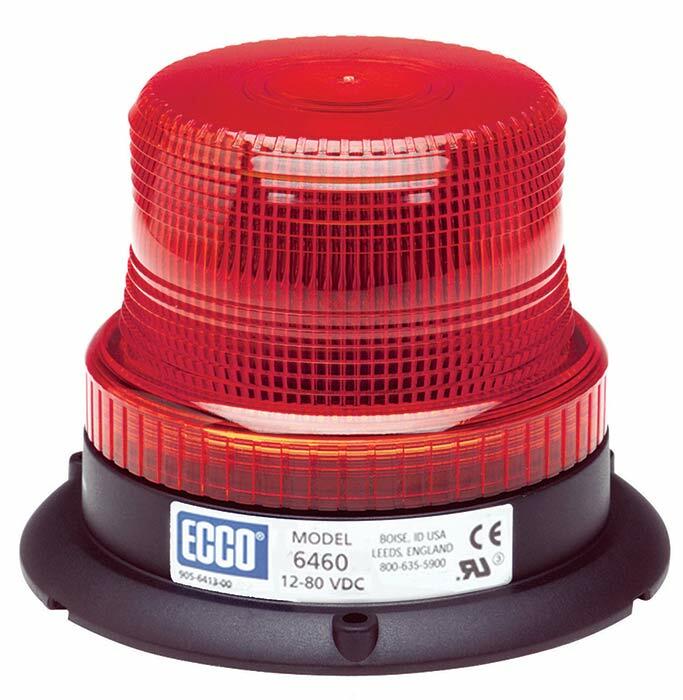 JG550-01-433: Low fuel warning strobe light for all JetGo diesel-hybrid models, red color (other color options available). 10-15 minute engine shutdown delay. JG550-01-435: Laptop computer auxiliary tray for JetGo GPUs. JG550-01-445: Breakaway 30' 4/0 DC GPU cable with molded aircraft plug. Includes 3-pole DC cable assembly with 2 each 4/0 cables (overall length: 30'); 3-pole DC pigtail (breakaway section) with 2 each 4/0 cables (overall length 3') with water tight male receptacle. 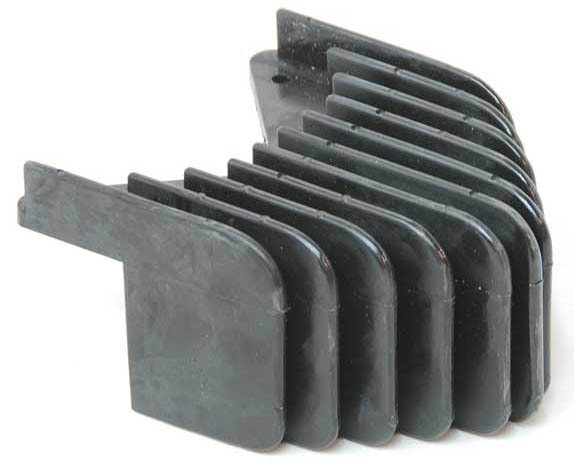 JG550-01-446: Onboard/dedicated 12" wheel chock set. Secured to unit for storage in RJ unit cable tray via stainless steel lanyard. 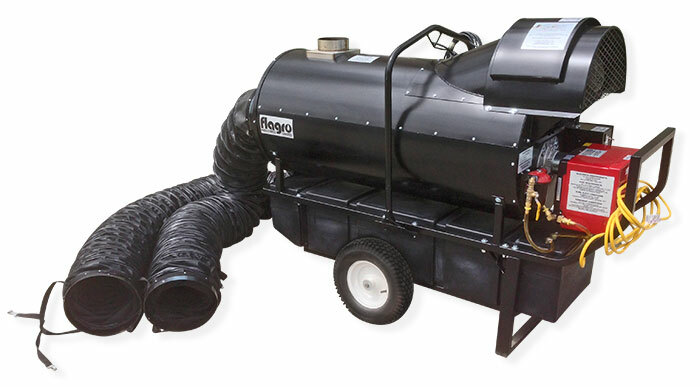 JG550-01-447: Flagro FV0-400 portable indirect fired oil heater, complete with two (2) 25' output hoses. Temperature is controlled by a remote thermostat (included) at duct end. 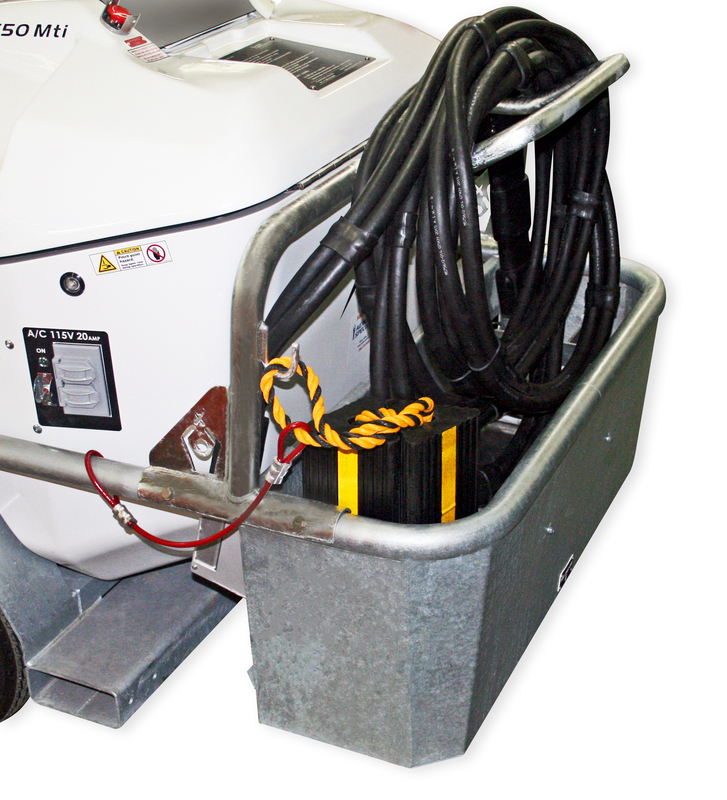 Heater can be powered by JetGo unit equipped with option JG550-01-429-24V. JG550-01-448: 12/14 VDC output option for JetGo GPUs. 875 AMP peak. 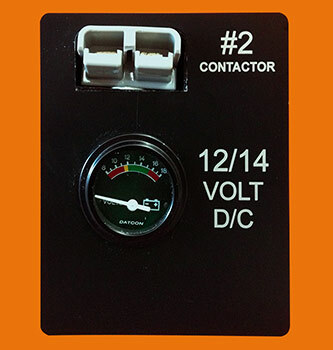 Separate volt meter and contactor (with switch). 20' 1/0 DC output cable with standard aircraft plug (color coded and labeled for 12 VDC). JG550-01-467: Safety cable interlock warning system. 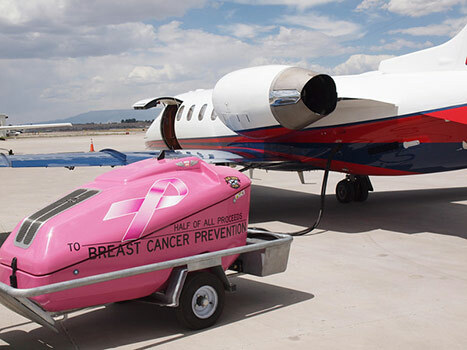 This system is designed to protect the aircraft and GPU by alerting the operator if the cable head is not properly stored when the unit is being moved. Featuring a flashing LED beacon and a 116dB alarm, this feature prevents the user from moving the GPU if the cable is still plugged into the aircraft. 004388: Galvanized cord rack for all JetGo RJ-Series GPUs. 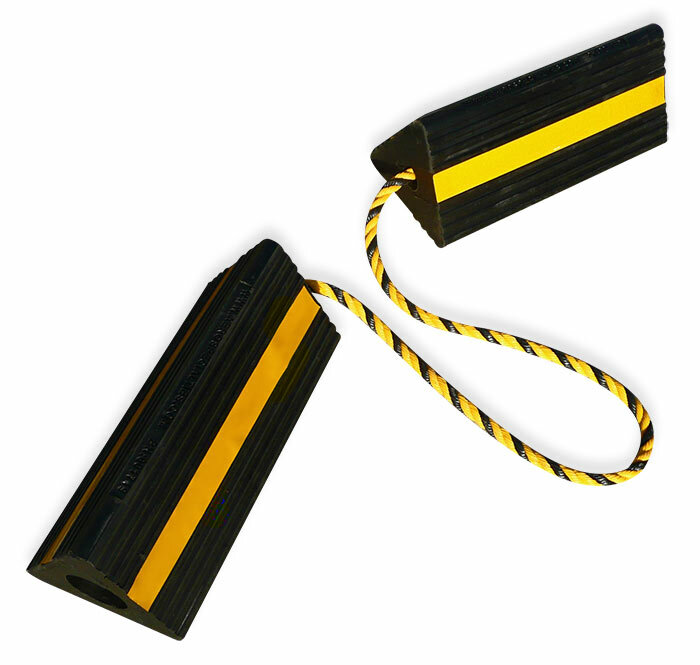 Facilitates easy handling of heavy DC cables - especially in cold weather areas. Heavy duty handle doubles as a push handle. Easy bolt-on option. 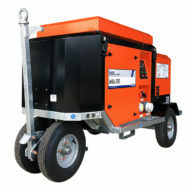 JetGo Tier 4i low-emission nonroad diesel ground power units are exempt from both California Local Air District permits and the California Airborne Toxic Control Measure for Diesel Particulate Matter. 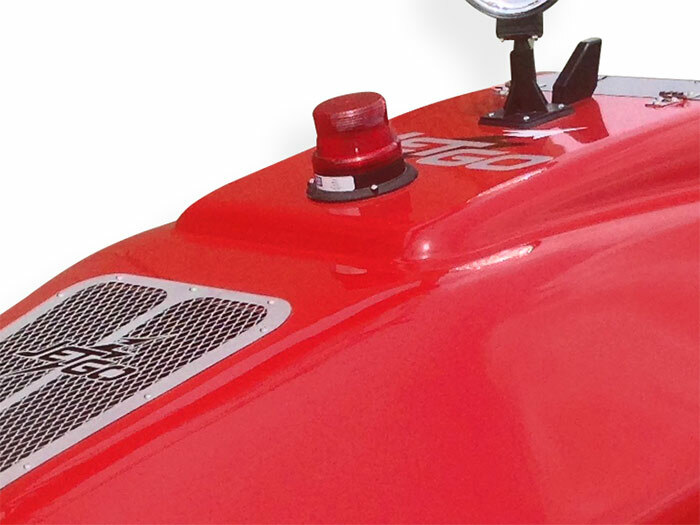 The Kubota engines used are rated at less than 50 Horsepower and are therefore not regulated by California statutes.